Ten years ago I’d have said that would be just as likely as me taking up knitting or square dancing. Not that there’s anything wrong with those activities, they’re just not my cup of tea. And camping wasn’t either. Or so I thought. Fast forward to May 2017 and my first adult camping experience in Italy. I wrote all about it here, as I discovered the window into a totally new world. My husband and I have been the proud owners of a Mercedes Benz Marco Polo since July 2017, and boy have we enjoyed ourselves. My husband marvels at how I’m so easily able to unwind when we camp, and how my stress level goes down to almost zero. And his observations made me think: what about camping makes me so happy? For example, did you know that many campgrounds, along with traditional pitches for camper vans, motor homes, and tents, offer mobile homes that sleep up to six? These are no ordinary scrappy mobile homes—with a bit of research you can find clean, modern, air-conditioned accommodation which can easily be used for large family reunions if you rent several. They’re complete with showers, fridges, cooking facilities and more—and many have big decks where you can have lazy sunset dinners together in the summer breeze. For children, in high season many campsites offer “animation” programs—daylong activities designed specifically for kids of all ages. Here they can meet new friends and stay busy and happy all day long. Many beachside campgrounds offer wonderful options for water sports, too. Windsurfing lessons and rentals, diving, snorkelling, and kayaking are but a few of the offerings I’ve seen. Want to rent a sun lounger and umbrella just like at the fancy resorts? You can do that too. Don’t want to cook over the campfire tonight? That’s no problem either. Most campsites have at least one restaurant that serves local food, and the price is usually reasonable and in line with what campers are prepared to pay. Markets are well stocked and offer local produce, meats, and dairy. Be sure to bring an empty liter bottle in case they also have “open” wine on offer. For 2 Euros we were able to fill it with the “house” red wine when we camped in Venice. While all of these aspects of camping are certainly attractive to our family, I can’t help but think that they are not the real reason I’m able to find so much peace and joy when I camp. 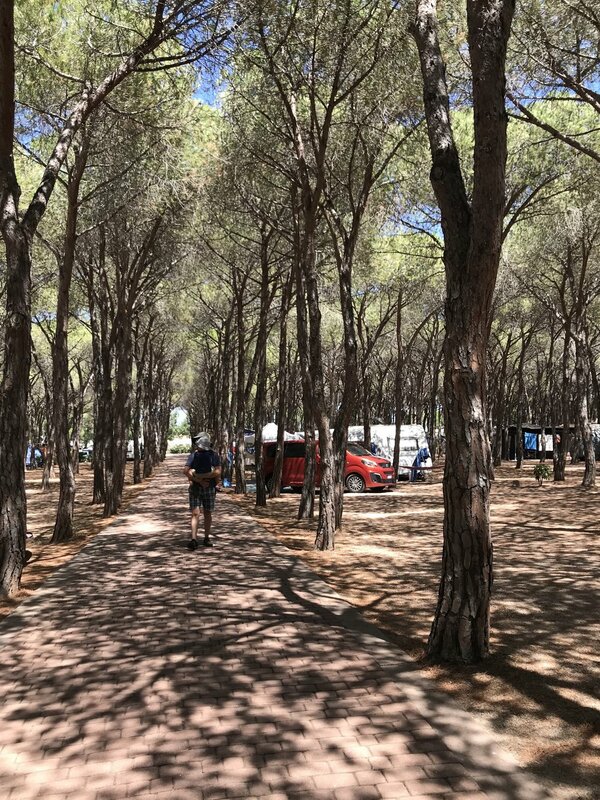 After returning home today from Sardinia it dawned on me that the real reason I love camping is that it offers a real time demonstration of what I can live without. I wear simple clothes, eat simple, local food, have limited use of electronics, have only a few pieces of furniture, and am surrounded by what matters most: my family. It allows me to take a step back from my busy world filled with possessions and recalibrate—and remind myself just how much I have, when I’m surrounded by almost nothing at all. If you haven’t yet given camping a try, I encourage you to go for it on your next holiday. You might just end up finding what you’ve been searching for in a holiday all along.